A fisherman hunting for metals by using a magnet in Florida’s Ocklawaha River got more than he was looking for this last week. His haul for the day was just a few metal scraps that also included a WWII hand grenade. The man and a woman, both 35, threw all of the metal, including the explosive ordinance, in the trunk of his car in a bucket. He’s lucky it didn’t go off leaving a huge messy splat on the highway. Instead, he took it to Taco Bell. Normal people who are thinking straight would have called the police but that’s not what happened here. They arrived at Taco Bell and then told the authorities about the grenade. Why… no one knows. A bomb squad was called to take away the weapon. It will be “destroyed off-site at a later time,” according to an incident report from the Ocala Police Department. Both of these people should be charged with putting the lives of others in danger over this move. The grenade was very corroded and probably not functional, but one never knows. It was taken away out of an abundance of caution which was the right thing to do here. Taco Bell was evacuated according to the police department on Twitter. But one officer said that they merely secured the parking lot to keep others away. Some employees stayed inside while all this was going on. The grenade was identified as having come from WWII but they don’t know from where. The nearby Ocala National Forest has been used for military training in the past, so that’s a possibility. But it’s unclear if that occurred in the 1940s. The couple involved would not speak to the press. I don’t blame them on that count. They weren’t charged with any crimes either. “A photo from the department appeared to show the rusted husk of a Mk 2 grenade, popularly known as a “pineapple grenade” because of the rectangular ridges on its body. The weapons were carried by troops from the tail end of World War I through the Vietnam War. “The unexploded detritus of war, such as landmines, unexploded bombs, and other munitions, is likely to vex authorities and civilians for as long as there is conflict — and the weapons that come with it. “World War II-era training bombs dropped by airplanes in the Atlantic have washed ashore in North Carolina, and U.S. coastal areas are littered with torpedoes and depth charges left after German U-boat attacks. “The dangers go back further. In 2008, an American artifact collector was killed restoring a cannonball from the Civil War, one of the estimated 1.5 million artillery rounds and cannonballs fired in the conflict. Estimates say as many as 1 in 5 were duds, and some are now buried in the ground and could threaten construction projects in Virginia, Pennsylvania and elsewhere. The ordeal at Taco Bell had a quiet ending. 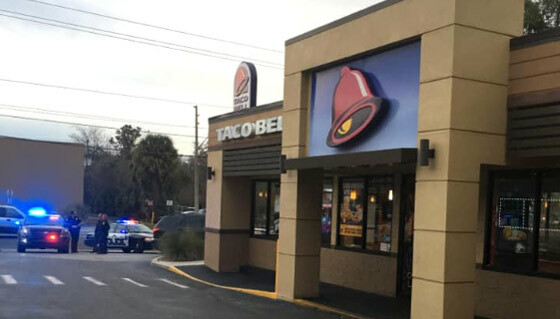 “Taco Bell has reopened,” the Ocala police said on Twitter. But it could have ended with a very big bang. Contributed by Roxy Hamilton of Joe For America.